Big Train Coffee has a whole line of blended iced coffee mixes. Java Chip is their most popular and this mix is used as the base for many iced coffees available in restaurants around the USA. 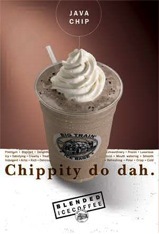 How Does Big Train Java Chip Ice Coffee Compare? Big Train Java Chip Ice Coffee contains 6.12 mgs of caffeine per fluid ounce (20.71mg/100 ml).